Reel Asian presents the best in contemporary cinema and takes festival-goers on a trip around East and South Asia. This year is the 20th anniversary of the festival and they’ve pulled out all the stops. Here’s a guide to some of the great programming that will be on this weekend in Toronto! The Tsukiji Fish Market in central Tokyo is lauded as the world’s largest fish and seafood market. In an effort that never ceases, Tsukiji caters to the needs of demanding professionals, offering more than 400 types of seafood and ensuring customers the best quality fish. 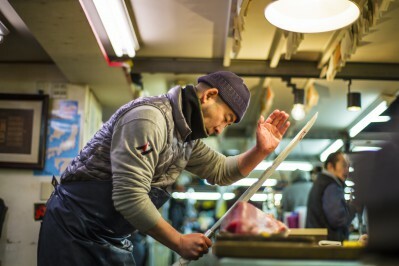 World- renowned chefs frequent Tsukiji, expecting hours-old product and relying heavily on vendors to guide them through “peak season” picks throughout the year. What results is an intricate, almost religious relationship between fishermen, vendors and restauranteurs. Who do aspiring artists look up to in a culture that doesn’t represent them? Following several rappers, director Salima Koroma paints a portrait of what it means to be Asian in North America’s hip-hop culture. Facing stereotypes, rappers Dumbfoundead, Awkwafina, Rekstizzy, and Lyricks (to a name a few) are caught in the constant battle of who they are versus how the public sees them.“Visibility is 100% the most important thing for Asian Americans, for all minorities right now,” proclaims Awkwafina. In this animated prequel to Yeon Sang-Ho’s ambitious and wildly successful zombie apocalypse live action feature, Train To Busan (2016), a wounded man collapses in front of Seoul’s central subway station. Assuming he is homeless, nobody is willing to help. Soon after, the man undergoes a savage transformation, setting off a relentless chase that sweeps through the station, first among those squatting in the corridors and then spreading to everyone in the vicinity. Working from personal home videos, filmmakers Kobayashi, Mecija, Nakhai, Supnet and Truong use experimental editing techniques, animation and documentary interviews to reflect on their understandings of cultural heritage and personal identities through their experiences with love, fear and womanhood. This collection of commissioned works will premiere alongside an original live musical score composed by Canadian orchestral pop band Obhijou. In 2013, Ohbijou announced they would go on indefinite hiatus, citing a need for “time to take pause and allow for new experiences,” and a discomfort with the way that constructions of otherness had confined readings of their work to a single narrative. Obhijou’s performance at Reel Asian will be their first time reuniting in three years – a rare opportunity for fans. In 1920, a young Tyrus Wong and his father emigrated from China to California. Upon arriving in the USA, Wong was temporarily detained as a result of the Chinese Exclusion Act, a memory which would stay with the 9-year-old for years. Later in his 20s, at a time when most Chinese Americans were employed as restaurant or laundromat workers, Wong defied all barriers to become one of the few Asian Americans to be employed as a sketch artist at Disney, working in the movie industry for over three decades and ultimately inspiring the unique look and feel of Bambi. Reel Asian runs from now until November 19. For more information, visit realasian.com.